Wind power is the conversion of the energy in wind into a more useful form of energy, like electricity. It is a renewable source of energy that helps to cut down on the pollution of earth's air. Wind power capacity has expanded quickly to 336 GW in June 2014, and wind energy production was about 4% of total worldwide electricity usage, and growing fast. 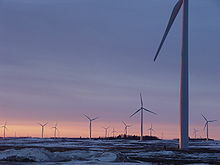 Wind power is widely used in European countries, and more recently in the United States and Asia. In 2012 wind power accounted for approximately 30% of electricity generation in Denmark, 20% in Portugal and 18% in Spain. Wind power stations use the wind to turn a turbine which turns a magnet inside a coil (a type of generator). The wind has kinetic energy (Movement energy) which is changed into mechanical energy by the blades on the turbine. The turbine then turns a generator which creates electrical energy (voltage). The turbine is usually connected by a [gearbox] to help control the speed it turns the generator at. Wind power stations have the advantage over fossil fuel power stations as they do not produce any greenhouse gases such as carbon dioxide or water vapour. They also do not produce gases that helps to make acid rain such as sulphur dioxide. They also make the environment safer and less pollution is caused. Wind turbines have to be carefully placed. They must be in positions where there is a constant, steady supply of wind. In fact, the wind must not become too strong or it may damage the turbine. Because wind is unpredictable, so is the amount of power that wind turbines will produce, making them an unreliable source of energy. Some people also consider wind turbines to be ugly and unsightly. Also, huge numbers of electricity pylons ("transmission towers") are built on land to carry the electricity to the electric company. These pylons in areas of natural beauty are a major reason for local people to object to wind farms and their consequences. Greater Gabbard wind farm turbines in harbour, waiting to be mounted. Red helicopter platform on top. ↑ "Wind power in the UK". BBC News. 2007-12-18. Retrieved 2010-03-10. The Climate Change Guide easy-to-understand information on Wind power. This page was last changed on 25 April 2019, at 07:31.